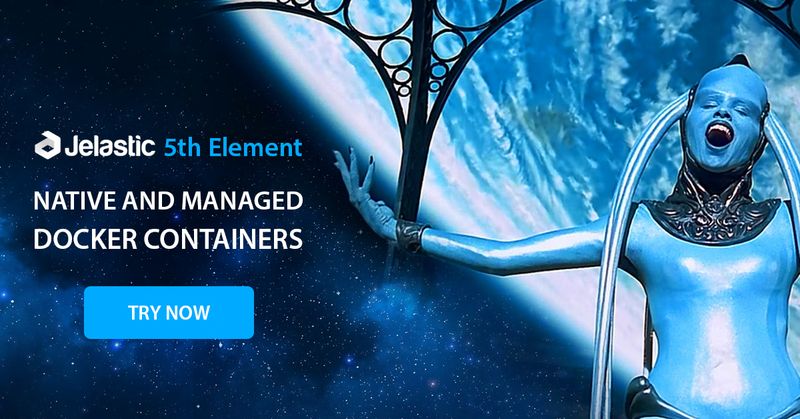 We are excited to announce a launch of new Jelastic product version named Fifth Element with support of Docker Community Edition and Managed Docker Containers within cloud platform. “Docker is a true cross-platform ‘glue’. The tight integration with Docker native solutions reduce the deployment barriers for developers and opens up new business opportunities for hosting providers by redefining economic at scale in hybrid and multi-cloud environments,” said Ruslan Synytsky, CEO and co-founder of Jelastic. Starting from this version Jelastic hosting providers are able to offer their customers Docker Community Edition cloud hosting with full compatibility to native Docker ecosystem. As a result, developers can deploy their containerized application to Docker Swarm clusters or standalone Docker Engine using docker-compose, docker service and stack deployment commands, remote connection via docker-machine and generic driver, at the same time, benefiting from Jelastic automatic vertical and horizontal scaling, multi-cloud and local data centers availability, collaboration functionality and pay-per-use pricing approach. “After close cooperation with Jelastic, we are excited about the launch of native Docker support. From today, our customers benefit of a seamless end-to-end integration in the Docker ecosystem, starting on developers computer and ending on our multi-regional cloud platform. A real PaaS also comes with packaged, certified and managed software stacks. Now that it’s based on dockerized containers, software stack upgrades and redeployments just became as easy as possible.“ says Reto Giezendanner, Cloud Architect at innofield. In addition, within the current 5.0.5 release, a set of certified software stacks was also converted into the dockerized containers that are packaged, proven and fully managed by Jelastic team. Such implementation simplifies delivery of the new versions for the appropriate software allowing Jelastic to update stacks right after a new version is released, so any vulnerability or security issue can be resolved almost immediately after the official fix. “Our customers were looking to utilize Docker engine to benefit from the development work they had already made. A new platform release also makes it possible to deploy services via Docker compose, which is great. These updates within Jelastic allow covering new use cases, for example with other container orchestrating products like Kubernetes or Rancher. We aim to be a forerunner in the field of modern PaaS products and maximally meet the requirements of the customers,” claimed Heikki Lavanko, Head of Solutions at DataCenter Finland. One more distinction of managed Docker containers from native is an intuitive UI focused deployment (in addition to SSH and CLI). Also, customers can benefit using containers in conjunction with integrated resource usage monitoring, load alerts, autoscaling triggers and Cloud Scripting for CI/CD automation, dynamic clustering and topologies updates. Find out more details about the Native and Managed Docker containers support by visiting Release Notes and the official page.